Help her puppy bed time be a comforting experience for her as this is the first night she is away from her mother and her littermates. The first night your puppy is at home is often a little scary for her. To make her feel less afraid and more secure, ask your breeder for an item with her mother's scent on it to put in her bed, the smell will be reassuring for her at puppy bed time. It's also helpful to put either a sound machine that has a heartbeat sound or a clock with a tick tock sound in his bed as this reminds him of his mother and will help him sleep and feel comforted. Some people use a warm hot water bottle in the puppy's bed but be careful he doesn't chew a hole in it. It's best to shut the door so your pup doesn't get out unbeknownst to you and roam the house, especially when not house trained. This gives your pup the peace to go to sleep knowing he's secure in his home. It also teaches him, for the future, when he's tired to go to his crate himself and take a nap. He'll learn this is his safe haven when he's tired or needs some alone time. Decide on the type of bed your poodle will have. You can purchase a crate, discount dog beds or a heated pet bed, or pile up some blankets in a corner. 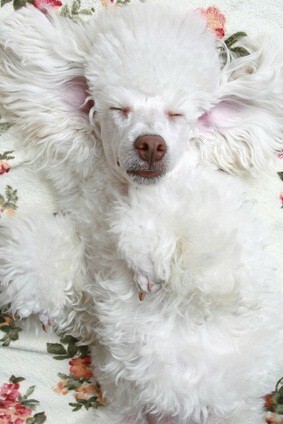 Poodles need an area that is their's alone, so choose an area where they can sleep without being disturbed. They need to perceive it as a safe place to snooze when it's puppy bed time. If you get a crate, it's not to be used as a punishment area for your pet. Get a crate the size your adult poodle will be, make sure there will be plenty of room inside for her. Buy a mat for your crate and put some toys in it for her. If you hear your new puppy crying at night, it's best to leave her alone. If you hold her every time she cries, you'll have a crying adult dog on your hands every time he wants attention and affection. As heartbreaking as it is, it's best to let your puppy fall back to sleep. She'll learn that bedtime is for sleeping and the crying will cease. Another reason to let your pup stay in his bed all night, if you don't, he'll probably end up in bed with you. If you want him to sleep in your bed, that's fine. If you don't, he'll need to learn that when it's time to go to bed, he'll be there until it's time to get up. And he'll learn crying won't get him out of his bed. Don't get a pet if you aren't at home very much. Plan vacation time out, too. What will you do with your pet? Who will watch, feed and execise her? If you can make time for your dog, are committed to raising her, will walk her daily, are prepared for grooming experiences and veterinary bills, are a loving and nurturing parent to her, then congratulations on your new family member! Remember that you are your pet's source of survival. She needs companionship, too. 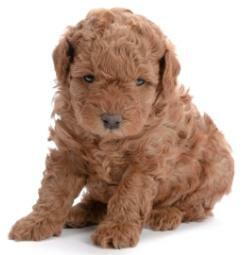 A puppy is a big responsibility but the rewards of love and loyalty are worth bringing a poodle puppy into your home.